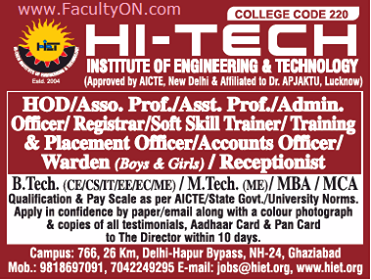 Hi Tech Institute of Engineering & Technology, Ghaziabad has advertised in THE TIMES OF INDIA newspaper for the recruitment of Associate Professor/Assistant Professor/HOD job vacancies. Interested and eligible job aspirants are requested to apply with in 10 days. Check out further more details below. College Profile: Hi-Tech Institute of Engineering and Technology (HIET) is a premier initiative of this society. The Institute aims to impart knowledge by attracting and involving well experienced, qualified faculty and providing best infrastructure facilities to the students. We are leading step by step to achieve our objectives to transform the Institute into one of the notable technical institutes of the country.